Topics addressed at the Summit are decided in consultation with One Young World Ambassadors around the world. With Youth Unemployment as a cross cutting theme, this year’s Summit will focus on Education, Global Business, Human Rights, Leadership & Government, Sustainable Development, and Peace & Conflict. Speaking at the Opening Ceremony of the One Young World Summit on the evening of Wednesday, 15 October, Mary Robinson highlighted the need to empower young people to participate in decision making processes that shape their future. Applauding their outstanding engagement on the eve of the Summit, Mary Robinson urged them to use the Summit as an opportunity for collaboration, to listen to each other and to act both individually and collectively as leaders and as participants in building more equal societies. During this year’s One Young World Summit, a special session was held on “Climate Justice”, which included the launch of the One Young World Climate Justice Prize. As one of the One Young World Counsellors, Mary Robinson was asked to deliver the key note speech for the session. 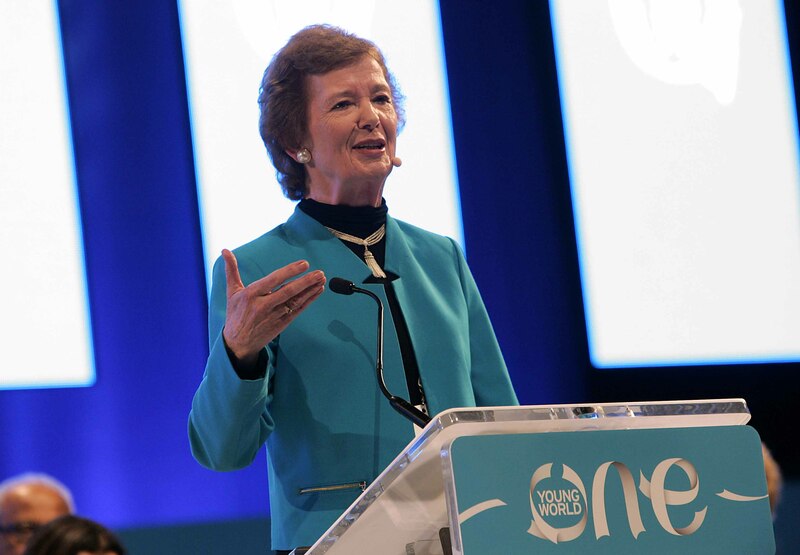 Anxious to engage the young leaders in the room on climate justice, Mary Robinson opened the session to the audience to discuss and learn from OYW Ambassadors on this matter. Read more. During the session, Mary Robinson and former UN General Secretary Kofi Annan explored with the OYW Ambassadors how global citizenship can empower young people to lead on intergenerational issues such as climate change. Moderated by environmental campaigner and Arctic explorer Parker Liautaud, the session took questions from the floor and from Twitter.